Paco Peña is a Spanish flamenco guitarist. He is regarded as one of the world’s foremost traditional Flamenco players. 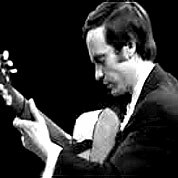 Pena began performing throughout Spain with a government-sponsored folk music and dance program where Peña established himself as a highly-regarded accompanist to Flamenco dance and singing.